12-time Best of Fest and 5-time Critics’ Choice winners are back with their larger than life masks! When Wendell discovers that both his wife and their beloved tree have vanished from the backyard, he must venture into the Wilds and face its mysteries to bring them home. Pixar meets Miyazaki meets Henson in this extraordinary adventure. 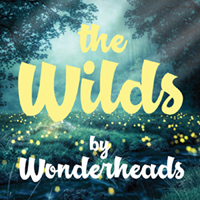 The WONDERHEADS return to Winnipeg with a world premiere of a brand new show. The new story features two main characters, an old man and his wife, in their signature big head masks. Though the masks do not move and there is no dialog, the performers’ physical movements clearly convey all the emotion in the story. Their staging uses a few key props, moved around while the cast is dressed in black, to set the various scenes of the main story line. The husband is on a journey into the Wilds to find his wife who has gone missing along with a tree from their yard. He meets a number of interesting characters through his quest which add some humour, magic, and fills out the story which will also tug at your heart strings. Excellently done.